Home \ Relationships \ Marriage \ What Is Marriage? Some pagan cultures used wedding rings in conjunction with idolatrous worship. Does that mean it is wrong for Christians to wear wedding rings? Considering the history of wedding rings, some wonder if the Bible forbids Christians from wearing them. Does it? It is true that God forbids worshipping Him using customs borrowed from pagan religions. It is also true that pagan cultures used wedding rings. Historical records are sketchy and not entirely consistent, but available records generally agree that the Egyptians started the custom thousands of years ago. These histories say the first “ring” was merely grass twisted into a circle. The obviously temporary nature of such a ring led to other plants being used, including reeds and hemp (rope). Then leather and, finally, metal became popular. Millennia later, the wedding ring was used in the Roman Empire and in countless other cultures. Knowing that the wedding ring was used by pagan cultures and being aware of God’s direction in Deuteronomy 12, some believers have wondered if wearing a wedding ring is wrong. Wedding rings symbolized many things in the different cultures that have used them throughout the history of man. Initially, traditions indicate that a man placed a ring on the finger of a woman simply as proof that he “possessed” her. The ring was placed on the left hand, considered the weaker side of the body, to indicate the submission of the woman to the man. More romantic notions were added with the thought that the “ring finger” contained a vein that ran directly to the heart. Also added at some point was the thought that this circular design implied an eternal bond (“till death do us part” is the more modern concept). Egyptians even attached significance to the circle within the ring, using it to symbolize the unknown. Truly, no newly married couple knows with certainty what the future will bring. 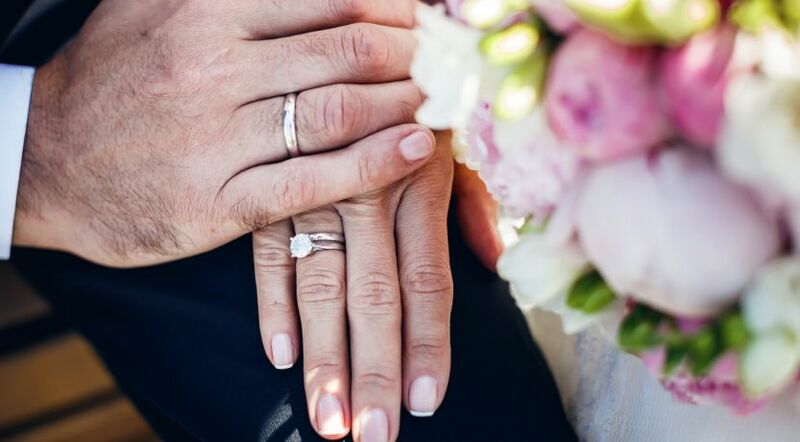 Interestingly, it seems the history of wedding rings for men didn’t begin until World War II, when men began to wear a ring as a reminder of their wife back home. Do these facts make it wrong to wear wedding rings? No. Let’s see why. How can we discern if it is wrong? It is entirely possible that some people in some cultures throughout history also attached a religious significance to the wedding ring. We acknowledge that because many cultures without God were highly superstitious, they routinely attached religious significance to many aspects of life. But does their widespread superstition mean that believers today should not wear wedding rings, in light of the intended meaning of Deuteronomy 12:29-32? How can we properly discern what God would forbid today? Consider exactly what Deuteronomy 12 says: “You shall not worship the LORD your God in that way.” The law has to do with direct acts of worship, not with life in general. Many actions in life are not worshipping a deity, even if some culture attached religious significance to those actions. A “grove” became a place to avoid when it was used as part of worship, not when it was a place to go during everyday living. It would be sinful for a Christian to have a grove of trees only if he or she tried to incorporate the trees into worshipping God. The question is whether an object or custom used in worship of pagan deities is then incorporated into the worship of God, not whether someone ever attached inaccurate religious significance to the object or custom! Early American Puritans shunned the wearing of wedding rings because they believed wearing jewelry was ostentatious, but their belief did not reflect the Bible’s teachings. Although the Bible does not command married people to exchange rings, Scripture nowhere criticizes wearing a ring in general or a wedding ring in particular. To the contrary, rings are often mentioned in the Bible in positive ways. In Exodus 35 we find that rings were included in the offering that the Israelites gave for building the tabernacle. God gave no indication of displeasure over the fact that the Israelites were wearing rings. He would not have accepted rings as offerings for the tabernacle if it had been sinful for Israel to have them. Earlier we find Joseph, who worshipped the true God in Egypt, accepting a ring from Pharaoh as a symbol of the high office that had been conferred upon him. Again, there is no indication that God was displeased. God continued to bless and guide Joseph after he had accepted the ring and responsibility. The ring that Pharaoh bestowed upon Joseph was a symbol of office and authority. In the New Testament parable of the prodigal son, Jesus spoke of the father giving a ring to his returning son. That ring undoubtedly symbolized the father’s love toward his repentant son (Luke 15:22). Just because a pagan culture attached an inappropriate meaning to rings, does not mean that wearing rings is wrong today. Pagans do not own the idea of using a ring to symbolize an important event, agreement or covenant. Several other Bible passages show jewelry being used to symbolize a special bond between people. In Genesis 24 Abraham sent his servant to find a wife for his son Isaac. The servant found Rebekah, and he gave her a nose ring and bracelets, signifying that she was the woman he believed God had provided for Isaac (see verses 22, 30, 47). Abraham’s servant said, “So I put the nose ring on her nose and the bracelets on her wrists. And I bowed my head and worshiped the LORD, and blessed the LORD God of my master Abraham, who had led me in the way of truth to take the daughter of my master’s brother for his son” (Genesis 24:47-48). God here used jewelry to represent His love, devotion and commitment. Therefore, there is no biblical evidence that it is sinful for Christians to wear wedding rings as symbols of their mutual love, devotion and commitment. Is It Okay to Wear Jewelry?